Who invented the Guillotine? The name of the person incorrectly credited with inventing the Guillotine is Dr. Joseph I. Guillotin (1738 - 1814), a politician and physician, who the device was named after. Antoine Louis (1723 - 1792) designed a prototype of the guillotine, which was initially called a "louisette". Dr. Guillotin advocated the "louisette" as a more humane method of capital punishment in 1792, and the device was later named after him and forever associated with his name. The "guillotine" was first used during the infamous Reign of Terror during the French Revolution and its most famous victim was Marie Antoinette, the Queen of France. The last use of the guillotine in France was on September 10, 1977. Definition of the Guillotine: The Guillotine is defined as an instrument of execution, once used for beheading people, consisting of a weighted blade between two vertical poles. The height of the poles of the guillotine were 14 feet high (4.26 metres) and were 15 inches (370 mm) apart. The metal blade of the Guillotine weighed about 88.2 lbs (40kgs) and fell at a speed of about 21 feet per second. Fact 1: Who invented the Guillotine? The machine that became known as the Guillotine was designed by Antoine Louis and its use was recommnded by Dr. Joseph I. Guillotin in 1792 during the French Revolution. Fact 2: Who invented the Guillotine? Prior to the invention of the Guillotine in 1792, there was a similar device that was used in Scotland and England to behead people which was called "The Maiden", and is obliquely referred to in the old nursery rhyme, Mary, Mary Quite Contrary". Fact 3: Who invented the Guillotine? "The Maiden", an earlier form of the guillotine used to decapitate victims, was introduced in Scotland in 1564 during the the reign of Mary Queen of Scots. "The Maiden" was a portable oak timber device with an iron blade and a lead weight attached to a peg and chord. Pulling on the chord of the "The Maiden" caused the blade to fall and decapitate the victim. Fact 4: Who invented the Guillotine? Today we view the terrifying guillotine as horrific, barbaric device but the alternative means of execution were worse. The worst methods of execution included the dreadful punishments of being Hung, Drawn and Quartered or being burnt at the stake. The most common form of execution was death by hanging. Fact 5: Who invented the Guillotine? Executions by beheading were considered the least brutal of execution methods and were accorded to royalty, nobles or important prisoners. In Britain the axe was the instrument generally used to perform the execution. If the executioner's axe was sharp and his aim was true, beheading was quick and relatively painless. However, if the axe was blunt, and the executioner was careless or inexperienced, might take several strokes to cut off the head. Fact 6: Who invented the Guillotine? One of the most notorious executions by axe in the Tudor period was the death of Margaret Pole, Countess of Salisbury who died on 27th May 1541. Margaret Pole refused to lay her head on the block. She was forced down but struggled to get and the executioner made a gash in her shoulder rather than her neck. She leapt from the block, chased by the executioner and struck by the axe eleven times before she died. Margaret Pole, Countess of Salisbury was 68 years of age. Fact 7: Who invented the Guillotine? The execution of the second wife of King Henry VIII, Queen Anne Boleyn, was afforded some clemency. Instead of facing the axe, Anne Boleyn was executed by a first-class French executioner who was an expert in the use of the heavy continental executioner’s sword which could swipe the head off a prisoner who was kneeling upright. Fact 8: Who invented the Guillotine? Beheadings by the sword and the axe were accorded to the nobles and elite of France. Commoners were executed by hanging but also by the most horrible, agonizing penalty ever invented - the Breaking Wheel. Fact 9: Who invented the Guillotine? 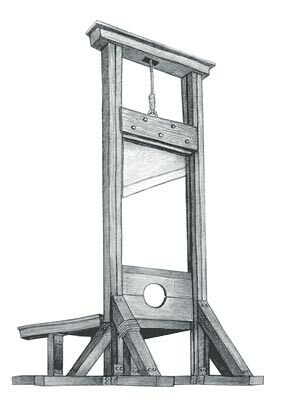 The origins of the French Guillotine stemmed from the idea that decapitation by a lightning fast execution device would be more humane than sword and axe beheadings, which were often botched, and would also replace hangings and the brutal breaking wheel. Also, given the situation in France at the time, a generic form of execution was deemed to be democratic and classless. Fact 10: Who invented the Guillotine? The man forever associated with the Guillotine execution device was Dr. Joseph I. Guillotin, who was born on 28 May 1738 in Saintes, France and died on 26 March 1814. Fact 11: Who invented the Guillotine? The early years of Joseph-Ignace Guillotin were spent in Saintes, France where he was raised by his family. Joseph-Ignace Guillotin was educated at University of Bordeaux and the University of Paris. Fact 12: Who invented the Guillotine? Following his education he worked as a physician and went on to gain recognition and the reputation of one of the foremost physicians in Paris and held the title of Doctor-Regent. Fact 13: Who invented the Guillotine? The French Revolution began in 1789 and was to last for 10 years until 1799. Following the storming of the Bastille on 14 July 1789, the National Constituent Assembly became the effective government of France and the popular Dr. Guillotin became one of 10 Paris deputies. Fact 14: Who invented the Guillotine? The man who invented the machine, that would become known as the Guillotine, was Antoine Louis (1723 - 1792). Antoine Louis, a member of the Academy of Surgery and a professor of physiology, became involved with the invention and improvement of various medical instruments and this work led him to design a prototype of the guillotine, which was initially called a "louisette". Fact 15: Who invented the Guillotine? Dr. Guillotin was aware of the "louisette" and suggested its use during a debate concerning capital punishments. Dr. Guillotin was a reformist, especially in relation to medical matters, and despite being opposed to the death sentence he proposed the idea of using a mechanical device to carry out executions. From his perspective a modern, mechanical device that could achieve the goal quickly and efficiently, inflicting less pain, and was far preferable to the use of the axe, the sword, the rope or the wheel. Fact 16: Who invented the Guillotine? In 1791 the National Assembly made decapitation the only legal form of capital punishment in France and the Guillotine contraption was unveiled at the Bicêtre Hospital in Paris in April 1792. Fact 17: Who invented the Guillotine? The state executioner, Charles-Henri Sanson carried out various tests on live animals and corpses. As a result of the tests the curved blade of the guillotine was changed to a sloping, triangular shape and the height from which the blade dropped was increased. Fact 18: Who invented the Guillotine? The design of the terrifying Guillotine was complete. The height of the posts of the guillotine were 14 feet high. The metal blade weighed about 88.2 lbs and fell at a speed of about 21 feet per second. The actual decapitation by the Guillotine took 2/100 of a second. Fact 19: Who invented the Guillotine? The victims of the Guillotine had their hair roughly shorn and were forced to lie face down on a wooden plank with their head protruding over the end under the blade of the guillotine. The steel blade was released by pulling a cord, or operating a lever, mounted on one of the uprights. After the execution the blade of the Guillotine was drawn up by a rope running through a brass pulley until it was caught by a spring release mechanism. Fact 20: Who invented the Guillotine? The cause of death to guillotined victims was due to shock and anoxia due to haemorrhage and loss of blood pressure. Fact 21: Who invented the Guillotine? A convicted highwayman called Nicolas-Jacques Pelletier became the first person to be executed by the guillotine on April 25, 1792. The guillotine was painted bright red and the public execution took place at 3.30 pm outside the Hotel de Ville in the Place de Greve. Fact 22: Who invented the Guillotine? Charles-Henri Sanson was the executioner of Nicolas-Jacques Pelletier and the execution by the guillotine was over in just a few seconds. The crowd were disappointed that the execution by the Guillotine was over so quickly. They were used to the old methods but the guillotine became the French instrument of death. Fact 23: Who invented the Guillotine? Just months after the execution of Pelletier the French Revolution entered the period known in history as the Reign of Terror (1793–1794). The purpose of the Reign of Terror was to purge France of enemies of the Revolution . The Guillotine was used to execute an estimated 40,000 people during the Reign of Terror. Fact 24: Who invented the Guillotine? Charles-Henri Sanson alone performed 2,918 Guillotine executions, and at the height of the Terror he decapitated 300 men and women in just three days. His victims included King Louis XVI, the last French king, on January 21, 1793. Fact 24: Who invented the Guillotine? Queen Marie Antoinette, was executed on the Guillotine by his son Henri Sanson, who had succeeded his father as Royal Executioner of France, on October 16, 1793. Tens of thousands of men, women, nobles, priests and well-known revolutionaries were executed by the guillotine, including Danton, Robespierre, Marat, Desmoulins and Saint-Just. The Guillotine became a symbol of the French Revolution. Fact 25: Who invented the Guillotine? The constant use of the Guillotine led to the blade becoming dull and in some cases the victim was only injured. In such circumstances the blade was cranked up and dropped again as the victim suffered horrific injuries. Fact 26: Who invented the Guillotine? A witness to many of the executions was a skilled wax worker called Madame Tussaud (1761-1850). Madame Tussaud was employed to collect many of the guillotined heads and made plaster casts of them, which she then filled with wax producing a reasonable likeness of the victim. Her work included death masks of King Louis XVI, Queen Marie Antoinette and Robespierre. Madame Tussaud toured France with her gruesome exhibition and eventually fled to England and founded Madame Tussauds, the famous wax museum in London. Fact 27: Who invented the Guillotine? Dr. Joseph I. Guillotin died on 26 March 1814. The family of Dr. Joseph Guillotin petitioned the French government to change the name of the guillotine. The request was refused and the family changed their own name. Fact 28: Who invented the Guillotine? The guillotine continued to be the method of execution in France for nearly two hundred years. Fact 29: Who invented the Guillotine? Many other countries including Sweden, Belgium, Germany, Greece, Italy adopted the guillotine as a method of execution due to its speed and 'humanity'. Fact 30: Who invented the Guillotine? A convicted murderer named Hamida Djandoubi (1949 - 1977) was the last person to meet his end by the Guillotine form of execution on September 10, 1977 at Baumettes Prison in Marseille. It was the last execution by beheading in the Western world. France abolished capital punishment in September 1981.